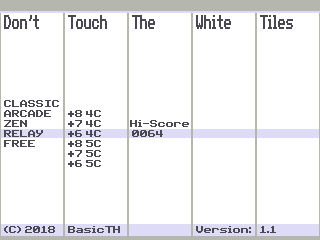 I was looking for a good game to port on the CE (because I want more projects to work on) and I realized that there was no DTTWT-game to be found in de 84pce/asm/games folder. I started yesterday evening and I don't really have anything yet besides the main game mechanism, but I intend to add different modes, high scores, etc. I might even download the original game again to see what I can add. For those still interested in this project, a quick update. - Thrill and sensation like you've never experienced before. I'll be releasing it very soon, after a necessary and strict debugging process (by which I mean playing it during my chemistry classes ). Need moar screenshots! Anyway, good luck finishing this project, and I'm looking forward to play it! Is it supposed to be similar to Piano Tiles but without the music? Yes indeed! I wanted to add the most important elements and gamemodes to the game, but calculators in general lack audio ouput. A shame, really. I would have loved to make it play Megalovania at maximum volume in class. There is code for sound now, so that can be added. I have the TI-84+CE for over a year now, and I have not found anything like an audio speaker (yet!!!). I believe the professional Cemetech-members have found a way to connect a speaker to the calculator, but this is just supposed to be a simple game for simple minds. I was wondering why the text's color is so faint. Is it meant to be that way? Yeah, I wanted it to be light-themed. Is it annoying? The game gained another play-mode. RELAY: You have to tap as many tiles before the timer runs out. Unlike in ZEN, there are checkpoints that give you some extra time. I also darkened the text, on jcgter777's request. This is actually addicting. Even without the music, it's still REALLY fun. I hadn't really thought about that! I don't have an exact idea yet on how I would implement that, but I might take a look at it later. Great job! I like the new graphics update. It'd be cool to have the press and hold things however, I'm not sure if it's possible. As far as I know, only the arrow keys and the del key work for press and hold. But in ICE, all keys can repeat. © Copyright 2000-2019 Cemetech & Christopher Mitchell :: Page Execution Time: 0.238556 seconds.